Green is the new blue in watches for those who want to stand apart from the crowd. This year’s most stylish sport watches are outfitted with green dials or bands in various shades and styles spanning the gamut from retro to contemporary to downright futuristic. 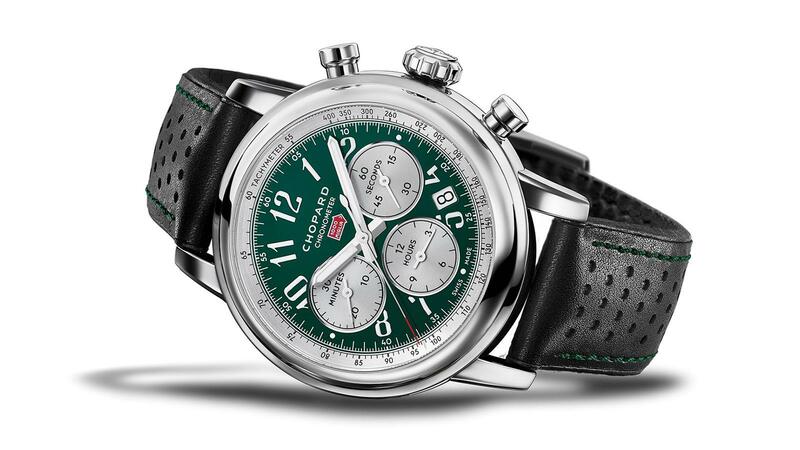 This year marks the 30th anniversary of Chopard’s sponsorship of the Mille Miglia classic car race that traverses Italy from Brescia to Rome and back, covering about 1,000 miles, hence the name. Chopard marks the milestone with a colorful collection of 42-mm steel chronographs featuring glossy, vintage-inspired dials that pay tribute to countries that raced under designated colors. Gear-head Anglophiles will be drawn to the British Green version ($6,080, bottom right) in a rich green shade that was established as Britain’s official racing color more than a century ago. For something sleek and contemporary, Hublot’s Classic Fusion Titanium Green Chronograph ($10,800, top left) looks fresh with a radiant satin-finished sunray dial, which color shifts from olive to deep forest, and a matching green alligator strap lined with rubber. Available in titanium or the brand’s proprietary King Gold alloy, the 45-mm case mixes satin and polished finishes for a refined aesthetic. It’s also available on a time-only model in four sizes. Always on the cutting edge, Richard Mille has a green version of the RM 67-02 ($131,500, top right) that pays tribute to South African sprinter Wayde Van Niekerk, who is putting the watch through his paces on the track. The special edition is one of a series of models honoring elite athletes in the colors of their countries, with a hand-painted rendition of each flag across the dial. The automatic skeletonized CRMA7 movement features grade-5 titanium baseplate and bridges and a variable-geometry winding rotor made of white gold and Carbon TPT. The highly resilient case combines superlight Carbon TPT and has colorful, striated Quartz TPT composites that are used in auto racing. Weighing in at a mere 32 grams including its special elastic strap, the RM 67-02 is the lightest automatic in the Mille lineup, so it won’t slow you down on road or track.